Hi there everybody! I hope you are all well, I have a quick random just because layout to share with you all today using the fabulous Echo Park Here & Now Collection but the 6×6 size! Yep I had so much fun just layering the 6×6 patterned papers together for this one and it looks so fabulous and how fun are the miniature versions of the printed papers eeekkk. Ok so my title needs to be outlined with Silver I have decided after editing these photos but the title is an A2Z Scraplets Chipboard Title that I have simply covered in some Black Ranger Stickles and I have layered the title over some Heidi Swapp Color Magic Banners which have been sprayed with Lindy’s Stamp Gang Starburst Stain Sprays. 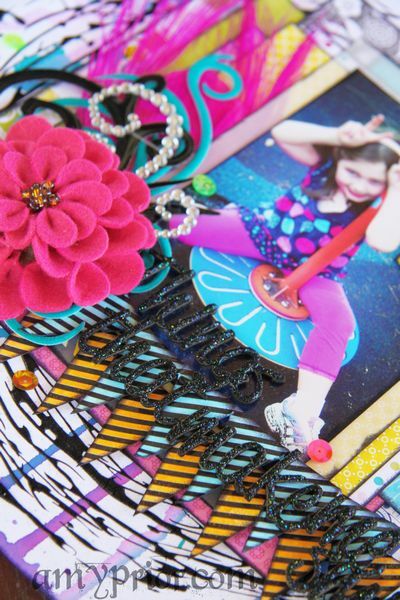 How fun are all the Heidi Swapp Color Magic stuff seriously I don’t think I will ever not love them they are so versatile and fun! My background was created using Dylusions Ink Sprays splattered and dripped and then I have finished off the background by inking the edges with Ranger Archival Ink and then added lots of random large circles with some Ranger Black Soot Tim Holtz Crackle Paint. To do this, you have to have the newer runnier versions of the Ranger Crackle Paint as the old versions were never runny and simply all I have done is used the lid paint brush that is included and dribbled circles over and over again and until I was happy. You could do this with regular acrylic paint easily also or ink but I wanted the cool Crackled effect. The fabulous Feather is from Manor House Creations and I am thinking that I need to purchase more of these aren’t they just divine? 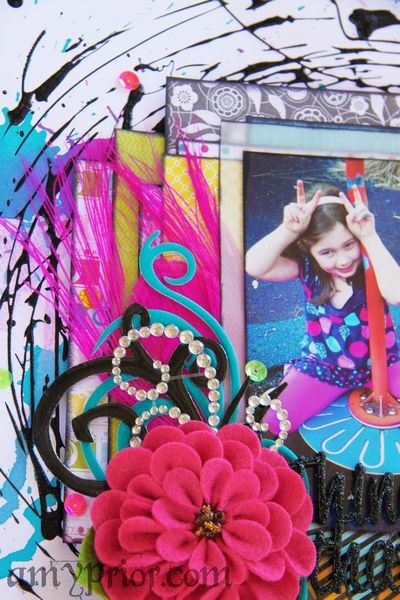 I have layered a few Flourish with a Bling goodies over the top of the feather and finished it off with a huge Donna Downey Prima Marketing Flower. The Live in the Moment Banner was fussy cut from one of the 12×12 Echo Park Paper Co Here & Now Papers and then I have inked the edges with the Ranger Archival Black Ink. Before I have layered all my papers together including some vellum, I have inked all the edges again with Ranger Archival Black Ink and using my Ranger Blending Tool. 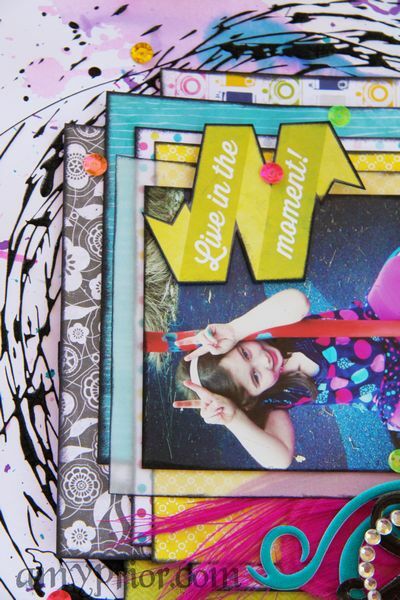 Well that is it from me for now but check back later today for a sneak and a link to my next PaperHaus Magazine blog post and video tutorial! Have you subscribed to my YouTube Channel yet? Click here to view my YouTube channel and subscribe today so you never miss the inspiration.